Hyperikon’s 2ft LED tubes offer the highest standard in commercial and residential lighting. These clear LED tube lights are compatible with most existing fixtures. Fluorescent replacement is simple-- an LED retrofit can be done easily with a ballast bypass (direct wire) installation. They are UL- and DLC-qualified to ensure the highest quality and safety standards and provide rebate eligibility! At Hyperikon we strive to set new standards not only with the quality of our products, but also with the quality of our customer service. Hyperikon LED tube lights are covered under our 5-Year Unlimited Warranty, meaning we’ve got you covered no matter what. Our customer service team is available 24/7 to answer questions and solve problems. We are committed to our customers and achieving 100% customer satisfaction. ✔ REPLACE AND SAVE - Reduce your energy usage and instantly save 60% on your electricity bill when you replace 25W fluorescent lights with 8W 2ft LED tube lights. ✔ 45,000+ HOUR LIFETIME - Spend less time and effort changing your light bulbs and switch to long lasting LED's. 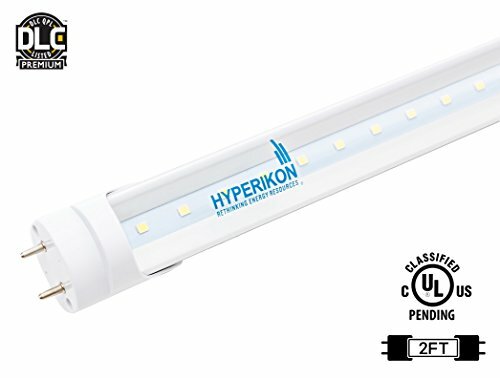 Hyperikon 2ft LED light tube have a life rating of 45,000+ hours, lasting over 20 years depending on use! ✔ BRIGHTER AND SAFER - Hyperikon 2ft LED bulbs are super bright with 1150 lumens of clean, crisp light! Plus, they are mercury-free, composed of shatterproof materials and UL- and DLC-qualified to ensure safety and quality. ✔ SIMPLE BALLAST BYPASS - These 24 inch LED shop lights are dual-end powered and require a simple, energy-saving ballast bypass installation. They are compatible with existing T8, T10, and T12 fluorescent fixtures. ✔ UNLIMITED WARRANTY - Hyperikon's hassle-free, 5 Year Unlimited Warranty covers all of our LED tubes. Whether for your kitchen, garage, or warehouse lighting, rest assured that your purchase is protected. Contact our customer service team for support 24/7!